Happy Monday! 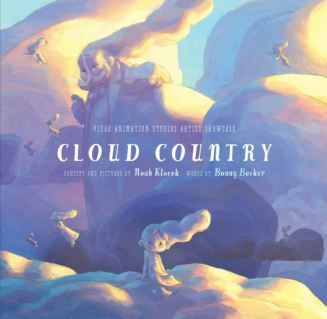 Illustrator and art director Noah Klocek dropped by to finish three of my sentences and share the stunning book trailer for his debut picture book, Cloud Country. I wrote the words in blue, and Noah wrote the words in black. Thank you, Noah! We have all looked up and spotted a tugboat or a fish in the clouds, but have you ever stopped to wonder where that fish came from? While everyone on earth knows about star-gazing and cloud-gazing, more than a few folks in cloud country spend time earth-gazing back. In school we learned about cumulus, stratus and cirrus clouds, but few of us were told about the very special daydream cloud. Sitting there, among the clouds, looking down and day dreaming is... a little cloudlet. Gale would like nothing more than to make on real cloud shape. But instead, she creates something different. Wait until all of Cloud Country finds out. When Noah was young he imagined that he would spend his life in a small cottage in the English countryside painting and drawing alone . Yet he has found that collaborating with others has been the greatest joy and made him a far stronger artist than he could have ever been on his own. Noah's experience includes advertising design and art direction; as well as matte painting, visual development, art direction, and production design for studios such as Industrial Light & Magic, PDI/DreamWorks, and Pixar Animation Studios. Always striving to find new way to tell stories, Noah's first illustrated picture book Cloud Country, a collaboration with Bonny Becker, will be published in Fall 2014. Beautiful trailer! This is definitely going high on my to-read list!